With more than 100 years in the industry, TOTO keeps evolving and surprising us with innovative new products and improvements on already amazing lines. At International Bath & Tile, we’ve had a close relationship with TOTO since we opened our doors, and it’s been incredible to see them grow into the billion-dollar company they are today. As one of their trusted partners we are always so excited to introduce and share their ingenious products with our customers, like the new NEOREST AC and NEOREST EW. As the first wall-hung NEOREST intelligent toilet-bidets, these products fit right in with the elegant design, superior technology, flawless performance, and extraordinary comfort found with the rest of the NEOREST Suite. 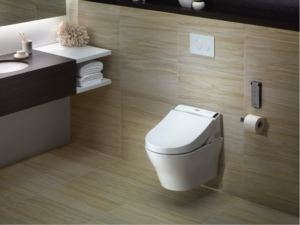 Here are the five people-first features to look forward to with the new NEOREST AC and EW high-efficiency toilets. 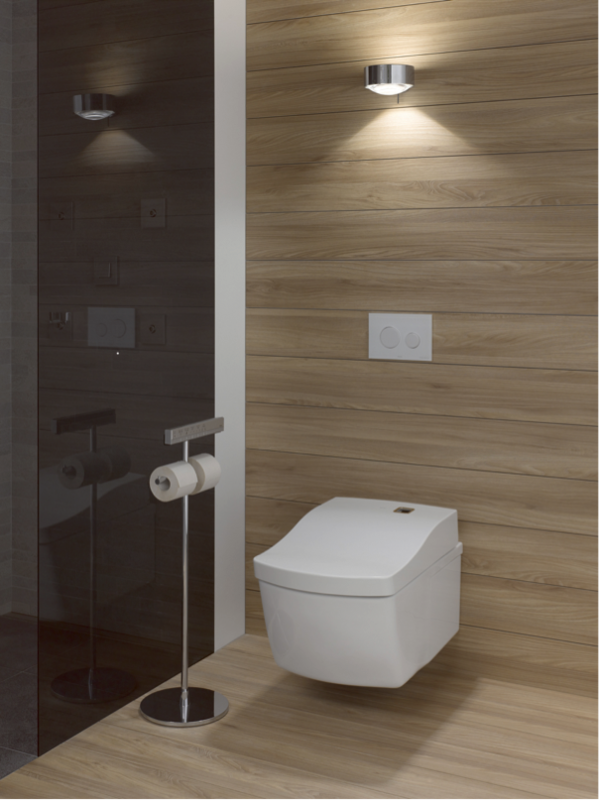 The new NEOREST AC and EW wall-mount toilets provide interior designers and consumers with a chic, metropolitan design option that works seamlessly in a variety of bathroom sizes and interior styles. Inspired by global architectural designs, the toilets offer a sleek, modern, clean, simple, and timeless look. 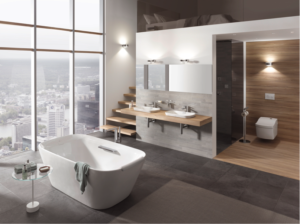 Function is still at the forefront, and the combination of design and practicality creates a pleasant bathroom experience for homeowners and their guests. TOTO continually works to exceed ADA and Universal Design principles to create high-performance designs that give users the best experience possible. Because the NEOREST In-Wall Tank System and water shut-off valve are stylishly concealed, the new NEOREST AC and EW save precious space in the bathroom. The user-friendly, dual-flush push plate can be easily removed to provide easy access to the tank’s interior components. Lifted from the floor, the wall-hung NEOREST AC and EW make cleaning beneath a breeze. ADA-compliant, these versatile units may be mounted at standard or Universal Height. 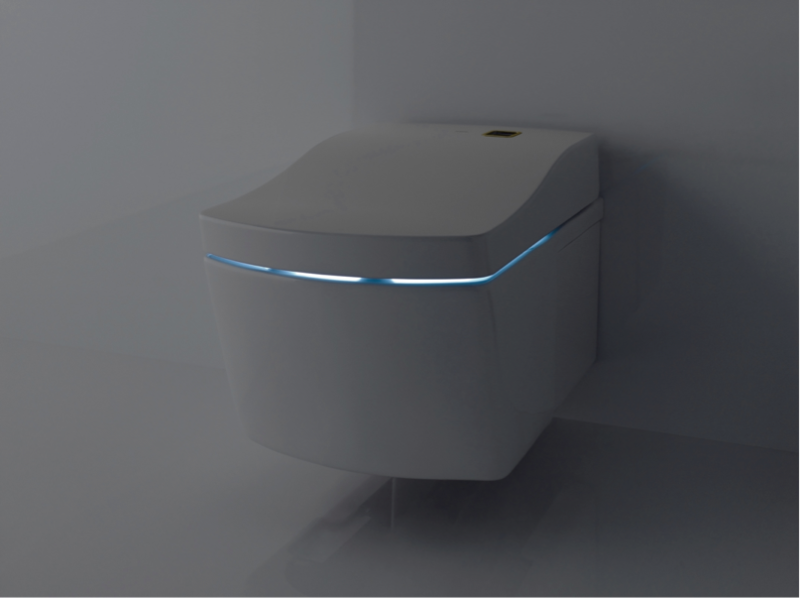 Other inclusive design features include the integrated personal cleansing system, auto-open/close, and auto flush features. The engineers at TOTO looked to nature—or specifically, tornados—for inspiration for the NEOREST AC’s and EW’s Dual-Max 3D Tornado flushing system. By creating the toilets with a seamless bowl interior and concave rim, the designers were able to harness the power of gravity using high-speed water jets to spin away waste. A single flush effectively removes matter, debris, stains, residue, and limescale buildup. These WaterSense-labeled, high-efficiency toilets run at an eco-friendly 1.28 GPF (gallons per flush) for solid waste and 0.9 GPF for liquid. And because they offer dual-flush technology, the average flush (for solid and liquid over the course of a day) uses just 1.0 gallon of water. 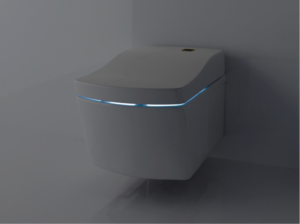 TOTO’s eWater+ technology benefits the environment and saves homeowners money on cleaning supplies, while keeping the toilet bowl exceptionally clean. The NEOREST EW’s cleansing technology pre-mists the bowl’s surface with plain water from the home’s incoming water supply. This prevents waste from sticking to the bowl’s surface, keeping it cleaner from the get-go 80% more effectively than with a dry bowl. And after each flush, the NEOREST EW mists the bowl again, but this time with eWater+ electrolyzed water. And during periods of non-use, the toilet mists the bowl once every eight hours with eWater+ to keep it fresh and clean on its own. The NEOREST AC takes TOTO’s cleaning technology a step further, as the most complete bowl cleansing system available on the market. Combining the 3D Tornado flushing system with a proprietary three-step Actilight cleansing system, the NEOREST AC remains incredibly clean and fresh for months at a time. This advanced cleansing system starts with TOTO’s eWater+ technology; a pre-mist wets the bowl’s surface to prevent waste’s adherence (80% better than if the bowl was left dry). After each flush, the eWater+ mists the bowl with slightly acidic, electrolyzed water to keep the bowl fresh and clean longer. Next, the NEOREST AC’s bowl is glazed with TOTO’s HYDROTECT titanium dioxide zirconium coating to give it an iridescent, mother-of-pearl sheen. Extremely hydrophilic, HYDROTECT makes it nearly impossible for organic substances to adhere to the bowl’s surface—enabling waste, lime scale, and mold to wash away with ease. When activated with UV light—which is integrated into the NEOREST AC’s seat lid—the HYDROTECT technology triggers a photocatalytic process, which breaks down organic substances at a cellular level, creating an even deeper clean. We invite you to visit International Bath & Tile to check out the new NEOREST AC and EW for yourself. Our experts can answer all your questions and help you find the TOTO product that will compliment your next project. Contact us by calling (858) 346-7455 or by visiting us online (http://www.ibtsdiego.com/) to schedule an appointment.